This recipe is a twist on Oysters Rockefeller, which is one of my favorite ways to eat oysters. This is a great recipe for entertaining because you can make the topping in advance, and when you are ready to serve, all you need to do is stick the oysters under the broiler for a few minutes. If you are feeling ambitious, you can shuck them yourself. If you are not feeling up to the challenge, you can buy a pint of already-shucked oysters. Then go out to eat raw oysters the night before, and ask to take home the shells: win-win. Simply run the oyster shells through your dishwasher and then you are ready to go! You will want to use fresh sausage and not smoked. If you can’t find fresh Andouille sausage, you can substitute it with another spicy sausage. You may have extra of the topping. It’s great the next day over pasta. Preheat the broiler, and position the rack a few inches from the top. Bring a large pot of salted water to a boil. Blanch the spinach for one minute, then remove, drain, cool, chop, and set aside. Reserve one cup of the cooking liquid. Heat a large skillet over medium-high heat. Add the sausage and brown for about 10-15 minutes. Remove the sausage. Add one tablespoon of the butter and reduce the heat to medium. Add the onions and celery, and cook until softened, about 5 minutes. Add the garlic, and cook for another minute or two. Add the wine, and scrape off any browned bits from the bottom of the pan. After the wine evaporates, add the reserved spinach, half cup of the cooking liquid, clam juice, sausage, and salt. Cook until all of the liquid evaporates, about 15-20 minutes. Mix in the rest of the butter. 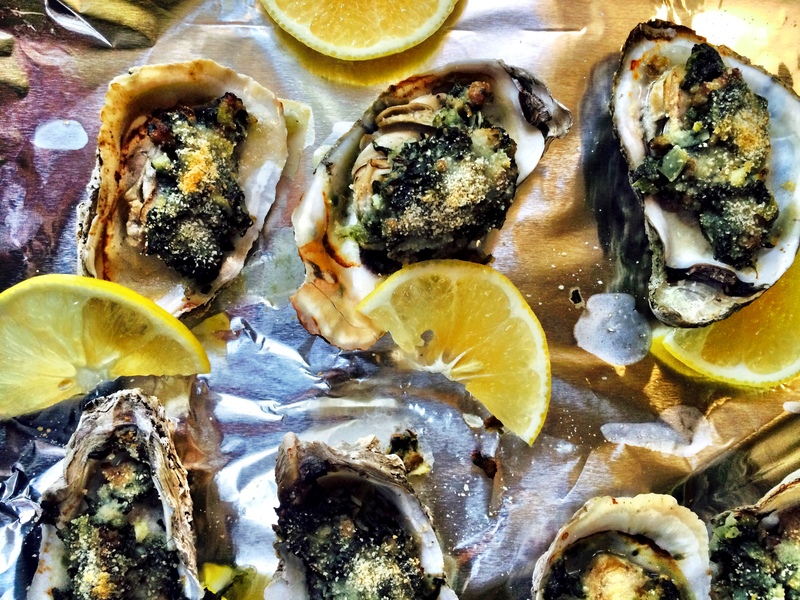 Arrange the oyster shells on a foil-lined baking sheet. 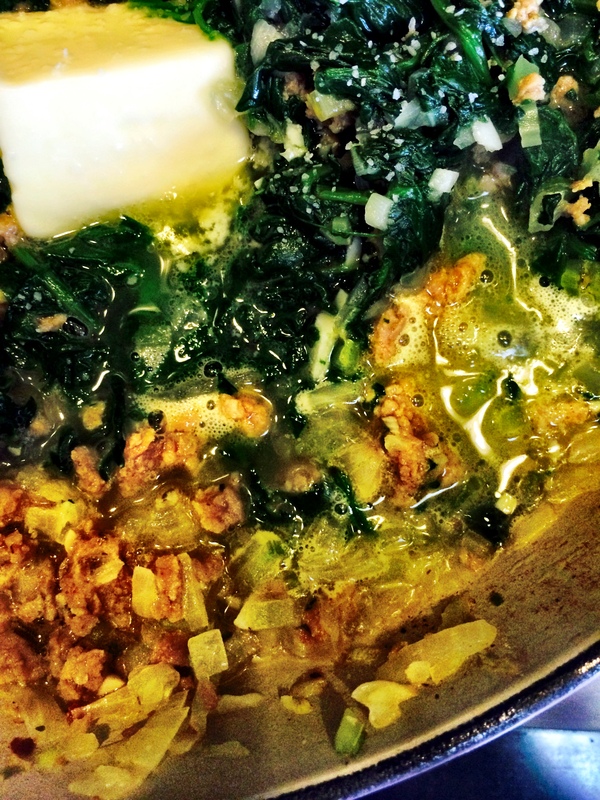 Fill each shell with an oyster, one tablespoon of the spinach and sausage mixture and top with some breadcrumbs. Broil for about 7-8 minutes, or until browned. Watch them closely!